During the last week I supported Hiroshi in doing something unique for his C Speed bike shop that would separate him from the myriads of other cycle shops in Japan. 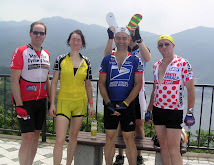 It's not enough that he is a very nice guy with lots of experience in cycling and a very well connected network. Now finally something visible, touchable, and most important of all rideable (almost), resulted from the last months of effort. 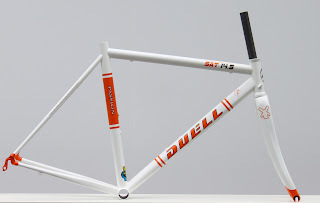 We have been negotiating with Duell, a small steel frame builder from the Netherlands for the last weeks and C Speed is now the exclusive distributor for Japan (with the exceptions of Hokkaido, Kyushu and some other inaka regions. Duell agreed to make a special paint finish for their bikes for Japan. We thought long about it and wanted to emphasize the handmade, Dutch-made and modern steel aspect of the bike. So many beautiful handcrafted things come from the Netherlands: Windmills, Pommes Frites with Sauce Speciale (OK, Belgian in fact) and of course inflatable Dutch wives. Unfortunately the Dutch national colors are basically the same as the French one and can be easily mistaken when put on a bike. So we came up with the idea to use the orange of the Dutch House of Orange-Nassau, from which the queen comes from. Commonly used as color of choice for the jerseys of the Dutch soccer team or the Rabobank cycling team. That the color is by chance orange is regarded commonly as a great plus. The frame left the workshop finally yesterday and will be shipped to Japan next week. 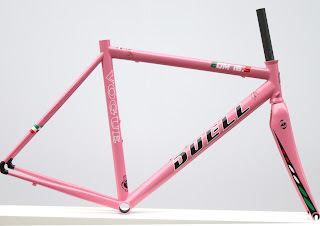 Hiroshi ordered another frame with the standard Duell design as well for display in his shop. The type of the Deda tubing (SAT 14.5 and EOM 16.5 respectively) are noted on the top tube. 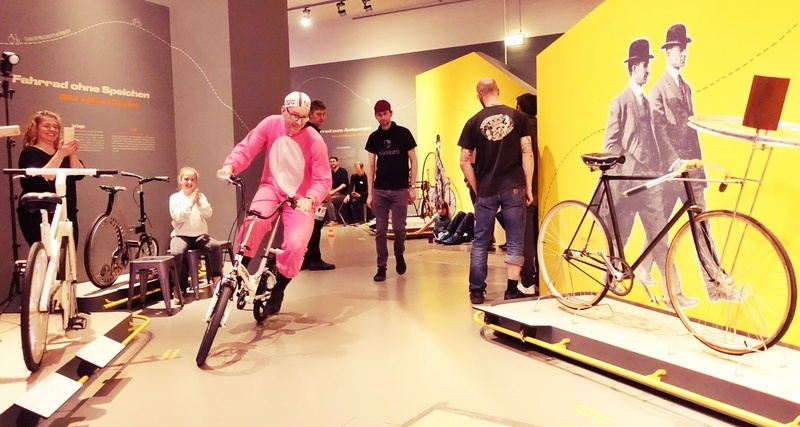 These are not old-fashioned steel bikes made from Reynolds 531 or Columbus SLX. They are also much lighter. 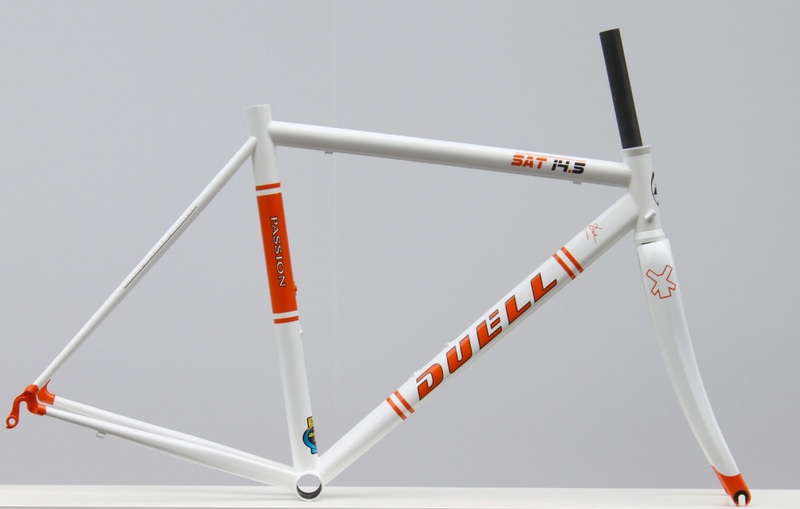 Duell has along history of building competitive steel racing bikes. Some of them can be seen on velobase, for example this, this and this. Here we see the old head badge design. I am excited to see how Hiroshi will built up the bikes and how they will look like when ready to ride. I really think that Hiroshi has a good eye for colors and proportion which might comes from the fact that he has worked for the fashion industry quite long. Although I have to say on the other hand, that I am not a big fan of the Avedio bikes he is selling. We did another project together in which I supplied a beautiful old Mondia frame from Switzerland in mint conditions and Hiroshi converted it into an even more beautiful single speed bike for late winter training. Michael...great achievements there. HIroshi told me the other day how much he appreciates all your "middleman negotiations". The man behind Duell is a great constructor indeed and the brand will surely help Hiroshi generate much-needed "sabetsuka" (differentiated marketing strategy) in this competitive market. This is great. Congratulations are in order for both you and Hiroshi. I hope (and expect) it is wildly successful for Hiroshi and C Speed. Hiroshi sent me a note last week about possibly working with a U.S. based wheel designer/maker ... but not sure he wants to go forward even with the initial inquiry, since they have an MTB as well as road wheel line. I have not been to C Speed in too long. Maybe we should work with Hiroshi to track down obscure track/Keirin component makers in Japan and offer their parts for sale by Internet to the world? I would be curious why these inaka regions are excluded. Do they think the sales potential is so high they'd rather go direct? ?